Plans for the new website are underway! I wanted to take a moment to give you a little peek into the new website. One of the things that we’ve wanted the most for the site is to have a dedicated space for Features, a place for Op-Ed articles, and an Editor’s Picks section where you can call attention to past articles that showcase the cool history of the East End. There’s a lot of work underway to create a great user experience so you can quickly get your content. So far the feedback in our alpha testing has been very positive. We’ve been working closely with local design and web firm, RedOrange. We worked with them because, as long-time readers, they were committed to helping us turn this community resource into something more modern. One of the coolest things they’re working on is a revamped Visitor’s Guide- it’s looking awesome. Can’t wait to show you! We are also working with Blake Cale, local graphic designer and also from 903 Creative, to give the CHPN logo a little bit of a spruce. Check out his Instagram here. Megan Rickman-Blackwood is also our newest contributorwith a strong background in writing and a knack for activism and community engagement, she reached out to us back in November of last year and has quickly written some cool articles and has led the People of Church Hill initiative on Instagram. She’ll also be spearheading a new contest that we’ll be announcing in May. 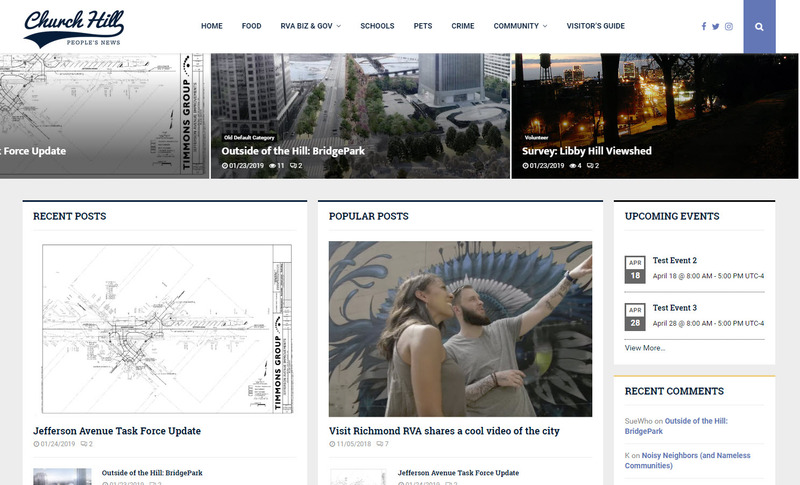 Many of you understand that Church Hill People’s News is more than just a hyper-local blog. It is a snapshot of the East End’s history since 2004 with thousands of articles that depict the growth of our city and our area. I hope that the new website includes identity verification in order to increase the accountability and civility. The anonymity on the internet allows people to say things that they would never say in real life.